Featured Image: 2017 C-USA Men’s Basketball Champions, Middle Tennessee. Photo courtesy of Conference USA. It’s no secret that the City of Frisco has plenty of fun to offer its residents and guests. When it comes to sports in particular, “Sports City USA” is quickly joining the diehard sports fan’s ultimate bucket list. More of a hoops fan? Division I College Hoops is headed our way as the Ford Center at The Star hosts the 2018 Conference USA Men’s and Women’s Basketball Championships, March 7-10! C-USA 2017 Women’s Basketball Championship, WKU Lady Toppers. Photo courtesy of Conference USA. What teams should I root for? You’re going to be pulling for the Men’s and Women’s basketball teams that play for the school you attended—don’t be ridiculous! Where will the 2018 C-USA Basketball Championship be held? Presented by the Baylor Scott and White Sports Performance Center at The Star, all 22 games of this can’t miss competition will be played at The Ford Center at The Star, which you know (and love) as the Dallas Cowboys World Headquarters. Yep, and it’s just a few minutes’ drive from Del Pietro’s! Mmmm wood-fired pizza sounds awesome. Will there be additional activities for fans and families? Yes! C-USA Fan Fest will be available at the Tostitos Championship Plaza in front of the Ford Center for fans of all ages. This free, family-friendly event will be open from 11:00am-8:00pm Wednesday-Friday, and Saturday 12:00pm-7:00pm. There are at least a dozen restaurants near the Plaza, as well. How do I purchase tickets to the C-USA Basketball Championships? Tickets are going fast, but they’re still available in two price tiers—general admission or premium. You can get yours here. Why does this writer give locations based on their proximity to delicious dining choices? Well, he skipped breakfast. Bad. Call. And plus, what better way to pre-game the C-USA Championships than with a visit to some of Frisco’s best restaurants? See you all there March 7th-10th! As a parent and teacher, I’m always looking for teachable moments to integrate science into our everyday experiences. Science can be found everywhere! Trace your shadow multiple times over the course of the day and discuss why it changes. Make giant bubbles and watch them float until they burst. Watch the sunset and discuss the cloud cover. Maybe even just talk about the weather! There’s no better time than National Science Day to get our kids excited about applied science! Where can kids learn about Science in Frisco? Whether it’s the new Frisco Skate Park, the Cottonwood Creek Park, or the Ruff Range Dog Park, get out and explore! Talk about the water features, the plants, and the creatures you encounter. When you walk, skate, or ride through a park, you can find science at every turn. Bring a magnifying glass, or incorporate a scavenger hunt into the fun! Check out the Frisco Fun guide for various youth classes, camps and other program offerings related to science, technology, engineering, art, and math! Ask a Librarian to direct you to the many Science-themed books on the Children’s floor! Did you know you can check out a STEM backpack full of great activities relating to weather, the human body, magnetism, or outer space (among others)? For kids age five and under, enjoy the STEM depot in the Read to Read Railroad to engage in early science concepts, such as making observations, questioning, sorting, patterning, simple math and more. Texas Astronomical Society holds once monthly free star-gazing parties where members and guests can get together to observe and educate others about the night sky. Save the date for the next event on March 10th at Frisco Commons Park. Approximately one dozen telescopes will be set up to look at planets, stars, and other celestial wonders. Visit Frisco’s newest toy shop and be in awe of the fact that chemistry sets of the past are now bigger and better than ever. You can build your own solar-powered rover, grow crystals, or even buy a rock tumbler. Frisco’s Sci-Tech science museum provides opportunities for kids of all ages to learn in both permanent and temporary exhibits that are sure to spark a child’s imagination time and time again. Sci-Tech is on a mission to inspire bright ideas through hands-on discovery experiences in the essential areas of math, science, and technology to kids of all ages. Fire Safety Town includes an interactive fire engine, and a “safety house”, where children explore and learn about home hazards, severe weather, and more. Kids can learn how to put out various types of fires and discover why certain items catch fire quicker than others. They’ll meet firefighters, learn about smoke detectors and discuss what to do if a fire happens at home. Frisco’s newest unique, indoor play area features rotating exhibits and hands-on activities designed for kids ages 18 months to 8 years. STEAM interactives (science, technology, engineering, art, math) engage the brain while providing hours of entertainment and new discoveries at every turn and during every visit. Visit the tree farm and talk about the water cycle and photosynthesis, or walk the aisles and discuss how some trees lose their leaves while others do not. While you’re there, you’ll be hard-pressed to leave without a new tree. Fannin’s customer service team is highly knowledgeable. The go-to place for enrichment activities for children in Frisco, with opportunities such as Young Scientist Labs, Robotics, and STEAM-related activities. Contact them for rates and availability for their special experiences, classes, and camps. Stop by Shades of Green, a local nursery specializing in organics, native and well-adapted plants and trees. Grab first dibs on the herbs before the spring rush! Walk up and down the aisles, indoors and outdoors. Read the tags and talk about why different plants require particular soils, sunlight, and pots. Feel free to ask questions as the staff is very friendly and always ready to teach you everything they know! Bonus: You can always dive into Pinterest.com to find a ton of science experiments that you do right at home. And check out these science jokes for kids! This time with our children will be over before we know it and we have to soak in every moment of wonder and awe while we can. Enjoy your family-friendly applied sciences, Frisco! While most extra-curricular learning centers are focused on helping students fill gaps with tutoring focused on meeting specific benchmarks, at Growing IQ, things are different with “discovery-based” programming. Students derive math concepts and grasp abstract principles on their own as teachers guide them through games, exercises, and group activities. Growing IQ launched after the “founding fathers” (literally – the company was founded by two dads of preschoolers) discussed their mutual concerns about the disconnect between the math and reasoning skills required for STEM and finance careers and the concepts being taught at the preschool and elementary levels. The Growing IQ learning framework is designed to help children develop their reasoning skills, learn and practice mathematical processes and vocabulary, analyze patterns, learn abstract concepts through concrete materials, and practice group-work skills. … collaborative and sensory-rich experiences. We empower our children to analyze, discover, examine, reason, think critically, and take ownership of their mathematical learning,” says Uma Mohan, the owner of the Frisco location. Rather than being separated into grade-based groups or levels, at Growing IQ the children are separated based on actual ability and current mathematical understanding. Teamwork and group learning plays a huge role in the programming. Groups of children work together to help each other learn concepts, more efficient ways of grouping numbers, and more effective routes to solutions. As the children solve problems together, they learn that there can be many approaches to math solutions and gain a more thorough, deeper sense of concepts. Children learn to analyze patterns visually and then learn how to verbalize what they’re seeing, so their analytical and comprehension skills grow in parallel with their communication skills. While the programming is discovery-based, the curriculum is directed by parents and teachers based on the individual needs of a particular child. This sets the Growing IQ program apart from play-based approaches and student-led learning such as the kind of programming found at Montessori programs. GROWING IQ does not focus on math concepts per se… rather, learning math concepts is a positive by-product, but not the purpose of the instruction. The teaching focus is on how to reason, problem solve through experimentation, and apply past learnings to new situations. For example, a few weeks ago, my daughter (10 years old) told me in the car ride home from Growing IQ that she had learned what ‘mean,’ ‘median,’ and ‘mode’ were. As she explained to me how she had learned about them in GROWING IQ class, that’s when I became truly impressed. She showed me a Batman figurine they had constructed in class (a plastic block with duct tape wings) and explained that they had used a rubber band to fling the figurine across the room. At this point, I thought, no wonder my kids love going to Growing IQ class – what kids wouldn’t love flinging Batman across the classroom! I decided to test my daughter’s understanding of these concepts by asking her what would happen if she had one super strong fling that shot her Batman really far across the room one time… What would happen to her mean, median and mode? Growing IQ takes STAAR testing into account and gears its spring programming towards helping students excel on the standardized tests, while also ensuring that they are gaining a holistic and thorough understanding of math concepts. For parents who would like to spend a little time during the upcoming Spring Break enhancing their child’s current math ability and understanding, Growing IQ is offering 3-hour programs from March 12th-March 16th from 9:30am – 12:30pm. Elementary students can enhance their math understanding, logic, and problem-solving skills through manipulatives, projects, puzzles, and games. Tuition for the week is $150. There is no registration fee. You can even “bring a friend” and save $25! To register, email frisco@tx.growingiq.com or visit Growing IQ’s Facebook page or website for more details. When Leo’s Street Taco Company recently closed after three years in business on Preston Road, it left a considerable void in the Frisco taco scene. Fortunately, that void has been filled with the recent opening of several new taco spots, including Mezcal Taco, just west of Toyota Stadium, which offers street-style tacos. Mezcal Taco proudly proclaims “nuestra casa es su casa” or our house is your house. And upon entering this small mom-and-pop spot in a strip center, that is exactly the vibe you get – that this is a small, cozy spot where the food is high-quality, delicious, made from scratch, and a place where the owners treat their customers as family. True to its name, Mezcal Taco offers 13 varieties of tacos. Four of those offerings are beef, a list highlighted by their asada tacos while two types of chicken tacos, adobado, and tinga, are on the board of fare. Three different pork tacos are also on their menu, with the al pastor being an outstanding choice. Other tacos on the menu include panela asada (cheese), nopalitos and two different types of barbacoa (beef and lamb). 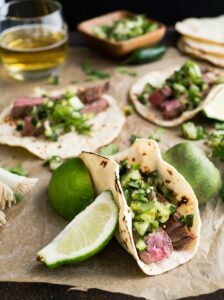 Tacos can be ordered on corn or flour tortillas and are served street style with the normal accompaniments of cilantro and onion. One big plus about this new spot is that they are generous with the amount of meat they put in their tacos, which means it only takes two or three to satisfy even the heartiest of appetites. Tacos aren’t all Mezcal Taco has on its menu. There are also three different “platillos” or combo plates: fajitas, flautas or enchiladas all served up with rice, beans, and tortillas. Mezcal also serves up burritos or burrito bowls served with choice of meat along with the usual accompaniments of cheese, pico de gallo and sour cream. Quesadillas, which come in chicken, pork or beef, are also available along with the standard side items of chips and salsa and guacamole. On my two trips to Mezcal Taco, I sampled a variety of tacos, including the Asada, which might be the best taco on their menu, which is saying a lot. However, the Picadillo, another type of beef taco, is also a must-try. You also can’t go wrong with either the adobado or tinga chicken tacos, which both have plenty of chicken that is perfectly seasoned. And as someone who is a huge fan of al pastor, which translates to shepherd style, seeing al pastor tacos on the menu is another highlight of their delicious menu. In fact, Mezcal’s al pastor might rival their asada tacos for the tastiest offerings on their entire menu. So, the next time you’re craving tacos, which if you’re like me, could really be pretty much anytime, check out Mezcal Taco. You won’t be sorry. They’re just a few dudes who done good. Well, better yet, perfect. On Friday, July 20, the online trick-shot sensations, better known worldwide as Dude Perfect, will visit Dr Pepper Ballpark live for the first time at a Frisco RoughRiders game for Dude Perfect Night! Dude Perfect Night is just part of an unbelievable summer as the RoughRiders roll out the BIGGEST promotional schedule is baseball history. While Dude Perfect has worked with the RoughRiders in three web-busting videos, Dude Perfect Night is a unique opportunity for RoughRiders fans to meet and interact with this internationally-famous and Frisco-based sports entertainment quintet, and perhaps Panda, in person. Dude Perfect will also take part in the game presentation when the RoughRiders, the Double-A affiliate of the Texas Rangers, face the San Antonio Missions. First pitch is 7:05 p.m. and Dr Pepper Ballpark gates open at 6 p.m.(5:30 p.m. for Founders members). Garrett Hilbert, Cody Jones, Tyler Toney, and twins Coby and Cory Cotton are no strangers to the home of the RoughRiders. Three videos have been shot there totaling nearly 44 million views. The latest video titled Baseball Trick Shots has garnered nearly 16 million views since debuting on Oct. 23, 2017. The other videos are Baseball Edition (13 million) and Dallas Stars Edition (15 million). We all grew up playing baseball and always enjoy going to RoughRiders games, so to have our own Dude Perfect Night at the ballpark is going to be fun for us and all the fans that come out to spend our special night with us,” Toney said. What are the details for Dude Perfect Night? The Riders are going all in on Dude Perfect for their special night. The team will be outfitted in specially-themed Dude Perfect jerseys (unveiled at a later date) to be auctioned off during the game to benefit the Make-A-Wish Foundation. Dude Perfect will take part in the postgame jersey presentation to the auction winners. Dude Perfect Night opens with all five members taking part in one of the most unique ceremonial first pitches ever seen. Inning breaks will feature Dude Perfect video highlights, along with fans trying to duplicate Dude Perfect’s one-of-kind trick shots. A public meet and greet with limited availability will take place at Bull Moose Saloon from 7:30-8:30 p.m. Additional fan giveaways will also be announced at a later date. Dude Perfect became YouTube stars after bursting on the online scene in 2009 while still students at Texas A&M. The group is currently the No. 1 sports channel on YouTube with more than 27 million subscribers and 4.6 billion views. Dude Perfect has also worked with stars in and out of the sports world, including Green Bay Packers quarterback Aaron Rodgers, Houston Rockets guard Chris Paul, actor Paul Rudd, singer Tim McGraw, Heisman Trophy winner Johnny Manziel, NASCAR driver Dale Earnhardt Jr., New York Giants receiver Odell Beckham Jr. and singer Luke Bryan. How can I get tickets to Dude Perfect Night at the RoughRiders game? The RoughRiders will open the franchise’s upcoming 15th Anniversary Season on Thursday, April 5 at Dr Pepper Ballpark by throwing the biggest party in North Texas – the Deep Ellum Brewing Party @ the Yard. Season ticket, group, and hospitality packages are now available by calling (972) 731-9200, emailing info@ridersbaseball.com or visiting RidersBaseball.com. It’s not what you should be doing, honey… it’s what you could be doing! If you’re so busy taking care of business, and everyone else, that you rarely make time for yourself, HeartStories is looking at you, Sister. Founded by Crystal Gornto, HeartStories hosts monthly HeartStories GNO event series to connect women with purpose in the busiest seasons of life. HeartStories was officially incorporated in January of 2013, and they held their first event in 2014 and began the monthly GNO’s in April of 2016 with 22 monthly events to date! At the time, I was selling cardiac medical devices, enjoying financial success in a male-dominated career, but not feeling personally fulfilled. There was a moment when I learned about the reality of local human trafficking, that completely rocked the heart of this native Oklahoma girl, to the core. It sent me on a journey to re-evaluate my purpose and my legacy. That journey led me to leap. I quit my lucrative career, that I’d worked so hard to earn, and liquidated my retirement to start something that would encourage other women on that same journey to more joy and purpose. I wanted to start a community to connect women and encourage them to not be held back by all the negative noise in their minds, and to live the stories of their hearts. The HeartStories logo is a pair of red heart-shaped headphones to remind women to replace the negative noise in their minds telling them that they’re not good enough or that this season of life is only about taking care of everyone else. Because that story is a lie. The headphones are a visual reminder to replace that negative soundtrack with a story of LOVE for themselves and for each other. When they see, or pop on our red headphones for a picture, they’re a symbol that they’re replacing the negative noise with the kind of truth and love that can only be found in the context of authentic friendships. What Happens at a GNO? Most women today are so busy trying to keep all the plates spinning, that they don’t make space for the rest and rejuvenation they need. At HeartStories, we’ve created a fun monthly GNO event series that helps women reconnect with their girlfriends, and themselves, to inspire the joy they crave and the courage to pursue their purpose. It’s like a mini-retreat in the middle of the week! Enjoying laughter, wine, hors d’oeuvres, and fun crafts or activities, we often feature a successful woman as our special guest for the evening, who shares the backstory of her real life and how she built her business with us. Then, she teaches us something new. We always wrap up the evening by 9:30pm so the ladies get home early enough to get the rest they need for the next day. Yes, there are many organizations focused on supporting women founders, networking for women in business, professional development, and self-development. You can find women’s weekend retreats, online classes, and workshops for just about anything you want to learn. Plus, loads of places around town for fun GNOs. HeartStories is none of those, and yet all of those at the same time. It’s not a networking group, although that happens naturally and beautifully within our community. It’s not a personal or professional development course, class, or workshop, although our events can touch on all of those things. And, it’s certainly not just a fun Girls Night with no purpose or intention. To our knowledge, HeartStories is the only company focused on rejuvenating the lives of women by reconnecting them, face-to-face with their girlfriends, with the purpose of inspiring them to live the stories only they can live… their HeartStories. What’s Coming Up This Season? We’re growing! We’ve reached capacity in our current meeting space. We’re contacted weekly by businesses inquiring about sponsorship. Our partnerships with other businesses is one of the best surprises, and biggest highlights of what we do. We’re seeing such a beautiful community emerge. Being able to connect our members and attendees with businesses that believe in supporting women to live with purpose is such a huge win and pure joy for us all. We’re laying out a strategy for how we will expand and grow beyond Texas, to serve women the world over, while continuing to improve the thoughtfully curated experience that is currently serving our local community. So, join HeartStories on the first Thursday of each month… You’re working your tail off to be the most amazing mother, wife, friend, daughter, and contributor to this world. We know you can get discouraged when you can’t keep all those plates spinning as fast as you’d like. Take a mini-retreat with your girlfriends, right in the middle of the week… More joy. More connection. More purpose. More fun. You CAN draw a line in the sand to say, “It’s time for me.” OR you can keep telling yourself, “It’s just a season,” until you look back and realize, it was your life.